Cleared and reported 1st term assignment. Cleared and reported 2nd term assignment. Cleared and reported 3rd term assignment. Cleared and reported 4th term assignment. Cleared and reported 5th term assignment. Cleared and reported 6th term assignment. Cleared and reported 7th term assignment. Cleared and reported 8th term assignment. Cleared and reported 9th term assignment. Witnessed the twilight survival instinct of Escha. Learned Logy was greatly injured in a past accident. Saw the "Ends of the Earth" with Awin. Saw an unexpected side of Threia and Marion. Fell victim to a classic ruins trap with Reyfer. Read a difficult reference book with Lucille. Found out that Wilbell is a real magician. Encountered Katla and Harry's fateful meeting. Harvested apples with Nio and Clone. Encountered Solle and Colland's awkward meal. Watched Duke and Colland's manly struggle. Participated in Duke's eating contest. Escha and Logy's new life begins. Planned for the future with the development team. 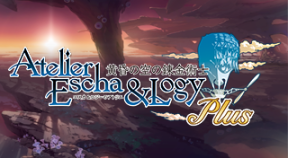 Logy retook his dreams with Escha's support. Destroyed the giant device used by a girl. Escha saw Logy off with a smile. Journeyed to the Ends of the Earth with Awin. Helped Threia with her research. Went on a search for treasure with Reyfer and Harry. Helped Lucille save people on the frontier. Decided to work with Linca and Marion in the development team. Saw the complete girl's association. Saw the complete men's association. Acquired a worn down air balloon. You became an alchemist of the sky…maybe. Gathered lithograph fragments, and discovered an ancient legend. Reached combat level 99. Are there any worthy foes left? Reached alchemy level 50. You're now an expert! Eliminated the behemoth living at the water spring. Destroyed the Slag guarding the ruins interior. Challenged the king of dragons, and proved humanity's worth. Defeated the giant alchemic creature in the Unexplored Ruins, and found the ruin's secret. Saved the girl's soul bound to Geosis. Stopped Flameu after she released her true power.